This package is nearly identical to the San Francisco Tour 3 package, but it comes with a beautiful custom made wedding album. You choose the photos and we create an 8X11 album for you with 40 photos. You receive proofs that allow you to review our design and then you can make changes if needed. Click here to see a sample wedding album. This album is one of our most popular options with a very large percentage of customers ordering it quickly after the wedding. I can honestly report that not one of our clients has ever not been thrilled with the final product. But just in case, each newlywed is afforded plenty of time to review the final proof before the wedding album goes into production. If you have a few modifications, we are happy to implement your suggested adjustments. We call this our complete package because it possesses virtually everything the couple could want. 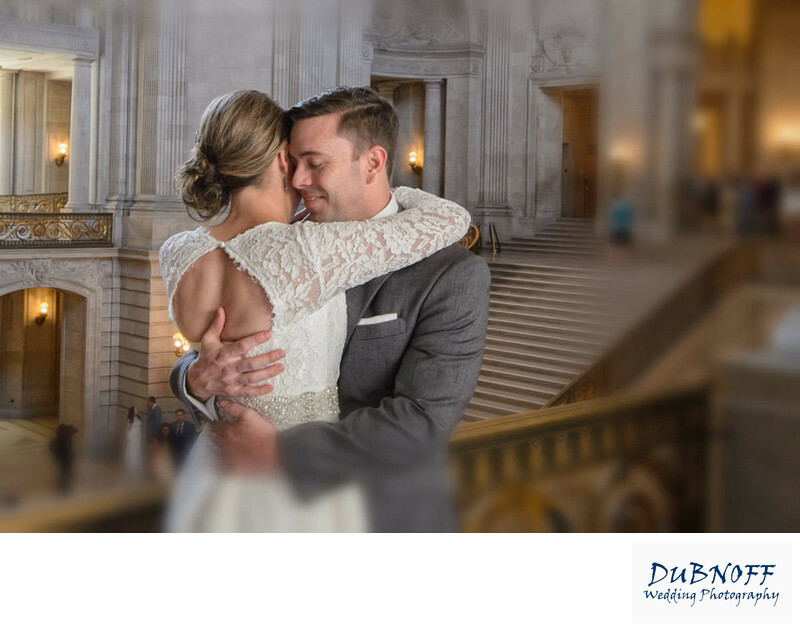 Not only do you receive an amazing wedding album, but this package comes with our SF wedding photography tour with 3 locations and 4 hours of coverage. If you prefer, we can offer the album with various lengths of coverage and numbers of locations. Ask us for a custom quote. Price for this package is $1,795 and you receive ALL of the proofs plus the wedding album. As is true with our other packages, you receive full resolution digital image files with full copyright permission. Download the image files directly from your secured viewing website or request a Dropbox file transfer. One of the great things about ordering an album from us is that we provide you with more custom editing on your chosen wedding album photos. We can retouch these 40 images if needed and also will take the time to remove distracting items for the background like people or exit signs! Even better is the fact that our lucky brides and grooms not only receive this beautiful wedding album with perfected images, but they also receive the actual image files with the increased editing. This is a bonus that most people dont realize, it is especially beneficial if it happens to be a busy day at San Francisco city hall. The more people and tourists milling about, the more you may want removed from the background. You will never see strangers in any of your wedding album images or the resulting high resolution files. The perfect gift for a loved one such as your mom or dad, is a parents wedding album. We make it easy, because you can just provide them with a duplicate to your own wedding album. The best part is that this duplicate album is offered to our couples at a discount. We receive 20% off on any duplicate albums we order and we are happy to pass that savings along to you. So the added benefit of selecting our Romance Album package is that you are given the option of purchasing a duplicate album for as much as $100 off the regular price. Use this album as Christmas gift to give to your grandparents or other close relatives. Did you parents help pay for your wedding? Give them one of these albums as a thank you gift and save money while you do it. It is even possible to order the duplicate in a smaller size (6X8 inches) and save even more dollars. The smaller album is still large enough to make a very cool parents album and has the added advantage of being "brag book" size. Your mom can carry this around in her purse and show her friends at coffee or while out shopping! We also offer optional unique parents albums for those who want their very own album with personally selected photos that are not a duplicate to yours. This option will cost a bit more but some parents prefer selecting different images than the San Francisco bride and groom might choose. 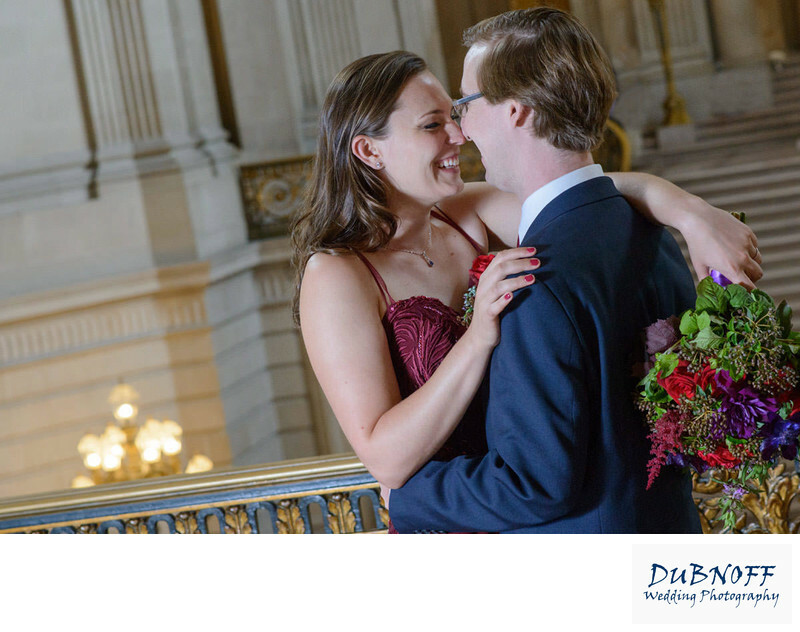 This SF City Hall marriage image was taken from across the building with a 200 mm lens. The sun coming in through the window created fantastic rim lighting and gave the bride's veil a dramatic glow. I also love the golden railing and how it works with warm light creating a magical glow. Candid moment caught right after the newlywed's ceremony on the edge of the Mayor's Balcony at mid day. 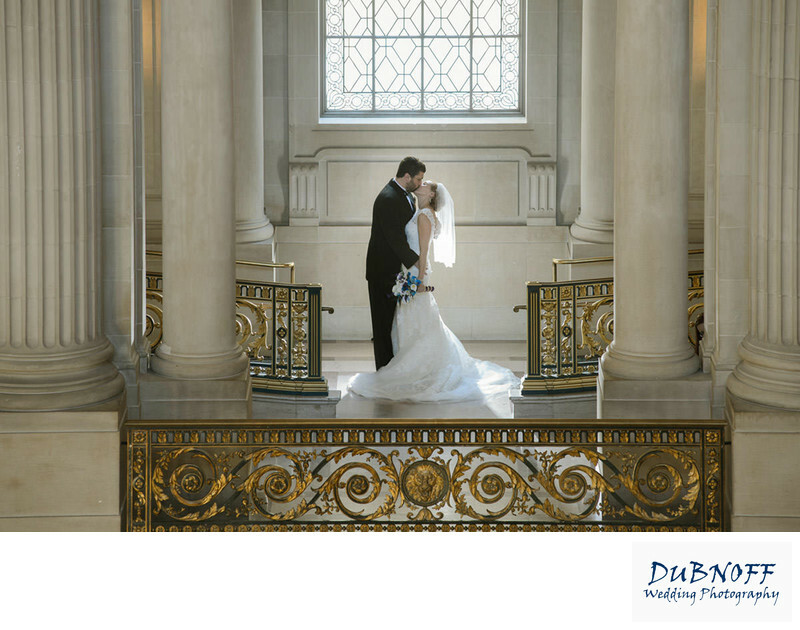 We took this couple to other San Francisco locations once we completed the Building photo tour.